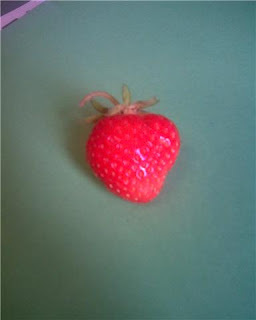 Sunday, when I was watering the garden, I spotted a strawberry almost ready to be picked. Imagine my dismay to find that on Monday, something--a squirrel or a bird or a slug--had gotten to it before I did and left half of it on the ground. But today, back watering the garden over my lunch break, I eyed another berry, not super red, but red enough. I usually am pretty good about sharing the fruits of the garden with the local fauna, but not today. I picked it. Admittedly, it might have benefited from another day in the sun, but I picked it anyway. It smells like a good strawberry, that sweet, bright, smell that they have. And I smile just thinking about it. This is a berry that I grew. And that will make it extra good when I eat it tonight. Growing something one's self is a counter-cultural act in America today, but is something almost everyone can do. Even if just a pot of herbs on the windowsill. Wendell Berry, long an agricultural advocate, has said we should all grow something to eat. It is economical, local, you know where it came from and there is a great joy of eating something that one nurtured to maturity. And for those of us with broader counter-cultural leanings, there is the sly smile that creeps across the face when eating something completely outside the clutches of big industrial food. I have my best Cheshire Cat grin on right now. I love my bread maker. A couple of years ago when I got interested in the ethics of food I put one on my amazon wish list. When a very large box arrived at my office near my birthday, I had no idea what was inside. It was the bread maker--a gift from my college roommate. I was thrilled, in spite of the less than environmentally friendly packaging to get it to me. I use the bread maker to make pizza dough a lot. Maybe I eat too much pizza. But, the pizza I make myself is such that I can control the ingredients and watch the salt. It also means I can use local flour in my pizza dough which was a real impetus for getting the machine -- the desire to use local flour. I hardly ever eat bread bought from the store, but on the rare occasion I do I try to get bread made with at least regional flour (there are a couple of brands in this area with flour from Montana). And I do wish I could find a better baguette recipe for the bread machine. I'd be willing to make the dough in the machine and bake it in the oven if that were possible, which I do for rolls. But tonight it is pizza on the menu. 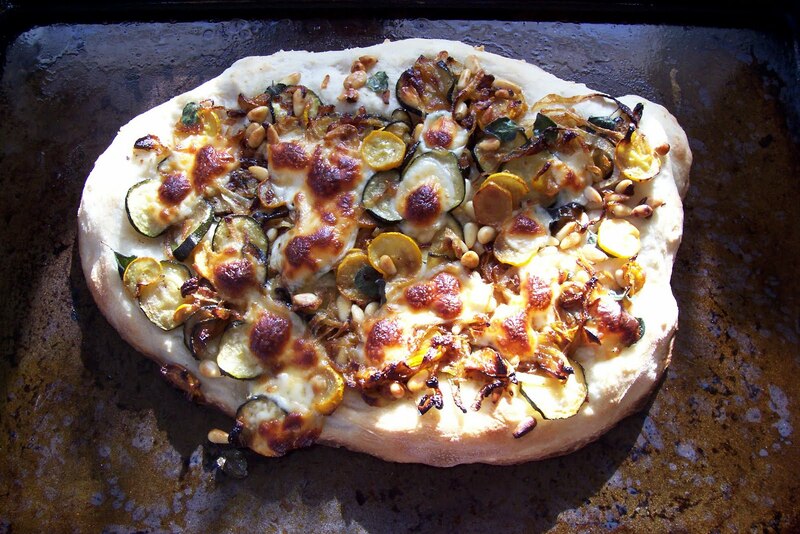 I am turning some of my lovely farmers market finds into the vegetable base for home made white pizza -- no tomato, just summer squash, zucchini, onion, some pine nuts and fresh oregano and just a little mozzarella cheese. Delish! I bought yellow summer squash today at the farmers market. They were normal sized--not gigantic. But on my return from being back east and checking on the garden I saw two puny beginnings of yellow squash on what I thought was a zucchini plant. Now, I know that the farmers are putting things in earlier, have more knowledge about their crops and likely have slightly different conditions than I have in the garden. 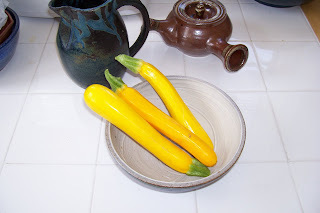 But still, it makes me wonder when will those two yellow squash be ready to pick? And when they are normal sized, not gigantic, will I be willing to pick them then? 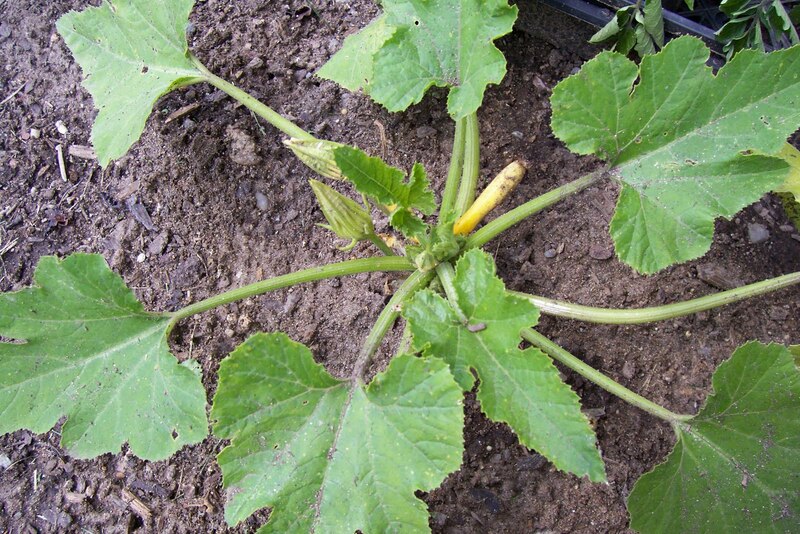 Or will I wait for the mammoth summer squash that are so often grown in backyard gardens? Only time will tell. And even so, with those two puny squash weeks away from being picking-worthy, all I can think about is summer squash and onion gratin with fresh bread crumbs and Gruyere cheese. Yum. I'll share the very easy and very forgiving recipe when the squash finally make it. Can't get much more local than the backyard (or community garden in my case) and I hope that offsets the imported cheese! While I was back east this summer I attended the wedding of an old college friend. Actually, I planned my trip back east around it. I have gotten into the habit of planning my summer trip to New England around some event or other and deciding which summer school session to teach given that. This was actually just a wedding reception -- the fun part. And it was a total blast catching up with the bride and some other college friends I had not seen in far too long. But with banquets like weddings and other similar events, eating ethically gets tricky. 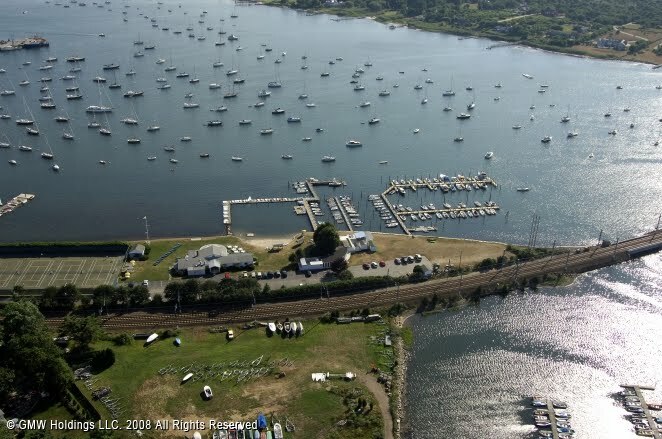 Here we were at the absolutely beautiful Wadwanuck Yacht Club in Stonington, CT, just outside Mystic, CT. The weekend in Connecticut was great fun as I was catching up with all sorts of friends. I had good Italian food in Bridgeport and got my Dunkin' Donuts coffee, too (which is had usually once a year because while it is good, it does not meet my regular fair trade standards, although I recently found out that their espresso roast is fair trade). This was more casual than many such "yacht club" weddings, perhaps in part because it was just the reception, the destination wedding took place in Mexico in April. So it was not your traditional New England sit-down plated dinner. There was a raw bar on the beach (not something I eat because I don't like it, not because of the ethical implications and honestly I didn't look closely enough at what they were serving to have an opinion about it other than I was told that most of what they were serving, minus the shrimp I would guess, was local). Noticing the raw bar did make me think of those losing their livelihoods in the Gulf of Mexico. There were also crab cakes and fajitas (an odd choice perhaps, but they were tasty). It was more like very heavy hors d'oeuvres and a lot of drinking. I did tell my friend who accompanied me that these were my "fun friends" from college. They did not disappoint. I believe a good time was had by all. Instead of traditional champagne, or from my own Italian heritage, the dreaded Asti Spumanti, there was prosecco, which I greatly prefer. It is crisper than champagne but much more like it than Asti. I always liked it, but fell in love with it again while in Florence a few summers ago. 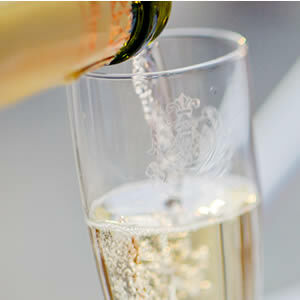 It is now my go-to bubbly, so was thrilled it was the choice for the wedding. It is, alas, imported and has some environmental implications because of that. But, it is far more affordable for the average person than champagne or even many of the good California bubblies. Lastly, there was no wedding cake--just a collection of beautiful, from scratch cupcakes. Which brings me to my last ethical note -- the pistachio. Like the almond, the pistachio is grown widely in the US, but many people think of it in terms of Italy (just like the prosecco!) which is one of the regions it is likely originally from. The US grows more pistachios than any other country but Iran. Pistachios are actually really good for you--good fat that lowers LDL cholesterol and anti-oxidant levels that rival green tea. 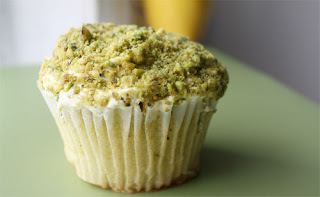 This was a very good cupcake, but likely some of the health benefits of pistachios were off-set by the other cupcake ingredients. It was dense and not too sweet, like a home made, not from scratch, cupcake. It wasn't dry like wedding cake can sometimes be either. But wedding feasts are an ethical triumph in different respects than much consideration of ethical eating. It is the joining of friends and family in celebration and food is one way we celebrate with one another. While the food was good, it was secondary. Honestly, I did not eat all that much -- I was too busy talking, laughing and having fun, and having a little more to drink than usual. So, the wedding, when it comes to ethical eating, likely rated higher on community value than on environmental, but I have to say it did good for the soul! I have just returned from two weeks back east to visit family and friends, so please excuse my recent absence. Being at my parents' home this time around meant eating a little differently. But the interesting thing for me is that it was more like I eat, at least the salads and veggies, when I am on my own than when I am usually visiting my folks. My father has some health problems and so his cardiologist recommended the South Beach Diet so he could meet his weight loss goals needed for an upcoming surgery. So, as my mother puts it "we eat rabbit food." I read Dr. Agatston's book prior to heading east to see what I was in for. Many of you might be familiar with his book that is less of a diet and more of a sensible way to eat. It isn't based on excluding any single food type, but is based on the glycemic index--an index that tells you about how food is metabolized and how your body uses the energy in food. All in all, it seems to make good sense to me given what I know about the ethics of food as it relates to health. But, does that mean that it is any more ethical given other considerations? Well, it really seems to come down to all the same food choice issues I have been dealing with. Eating salad is great, but it does matter where that lettuce was grown, etc. 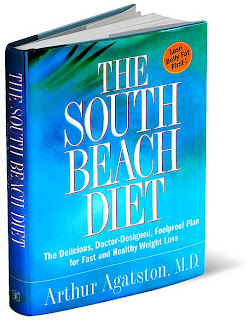 It does seem, however, that given some of the restrictions, albeit flexible ones, that eating on the South Beach diet could be ethical fairly easily--at least in the summer when there should be local salad veggies and the like in almost all locations. So, how did I fare when I was home for eating ethically? Not as well as I usually do, I am afraid. I ate what my parents had in -- nothing yet ready from their vegetable garden. Don't get me wrong, my parents don't eat poorly and they don't eat recklessly unethically, but they make choices differently than I would. And I ate out more frequently than I would have otherwise (and I also attended a wedding, but more on that later, different food implications there!). And I will admit to a few more cheeseburgers and some local delicacies that I look forward to when I am back east and don't worry about their ethical heritage. But, there is an interesting ethical side note. For my father's birthday my mother bought him a soda siphon. That's what he wanted. I had an image in my head of a very retro self-carbonating bottle. But, in actuality it is more like George Jetson meets Ward Cleaver. It's old-fashioned in the sense that it is a soda siphon, but Dad's is totally space-aged. Why is this an ethical side note? The environmental impact of buying a soda siphon and the CO2 cartridges needed to make soda water, even the concentrate to make flavored soda is minute in comparison to the plastic bottles soda comes in. It is also economical. My Dad suspects it will pay for itself in about a year (of course that depends on how much soda one drinks and how fancy a siphon one buys). I enjoyed the siphon's simplicity (no electricity) and have to admit considering getting one, but I don't think I drink enough soda to make it anything more than a temptation that can't be balanced out. Americans love a good deal. Likely, everyone does. Who likes paying more for something than one has to? We do, however, have to change our mindset when it comes to getting a good deal. We have to ask ourselves what it means to get a good deal and on what we are getting a good deal. Yesterday, as I was reading the Sunday newspaper, I got a little giddy when I realized that whoever stuffed the circulars in my paper had given me a double helping of them. 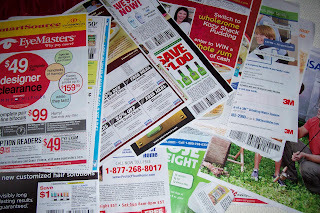 I did, therefore, have some extra paper to recycle, but I also had double copies of all the coupons. I use, however, fewer and fewer coupons now. There are fewer coupons for real food. When was the last time you saw a coupon for fresh produce? They generally don't exist. Sometimes there is a coupon for a particular brand of bagged lettuce or during holiday season for "cutie" tangerines, but rarely is there a coupon for green peppers or onions. The more whole food, real food, non-processed food that I eat, the fewer coupons that I use. In fact, the "double dipping" of coupons in yesterday's paper netted me very few. I did clip some, but mostly for non-food items. So, we have to re-tool our brains regarding what it means to get a "good deal." Now, price is part of getting a good deal, certainly. But so is getting something that is in itself good! I see value in a beautiful piece of fruit grown with care--buying that, to me, is a good deal, more so, than buying canned fruit, even if the canned is cheaper per ounce. Cooking for myself, from scratch, means I use fewer coupons, but I have a much better idea of what is in my food and where it came from than if I were to use a lot of coupons for more highly processed food. Does eating ethically therefore cost more? Maybe so, if we are counting cost in dollars, but there are other costs that are much lower. It has a lower cost to the earth. It might cost more in time, too. But it has a greater reward in the quality of the food one eats and the joy and relish one takes in that food. That, and whenever one finds something really good on sale, or special, or a coupon for something that is in fact more ethical, it makes it all the more special.